Home » Our Doctors » Vicki Leung, O.D. Dr. Vicki Leung’s extensive training includes a Bachelor’s of Science in Genetics Resources from the University of California at Berkeley, and a Doctorate in Optometry from the University of Houston College of Optometry, where she consistently received commendations for clinical excellence. She graduated with honors from the Gold Key International Service Organization. She completed her internships at the U.S. Naval Air Station in Brunswick, Maine, The Houston Light House for the Blind, and the University Eye Clinic, in Houston. Dr. Leung’s research involved 2 areas: 1) the detection of infant color vision, and 2) the treatment of nystagmus. Her research involving nystagmus was presented at the American Academy of Optometry in 1990, and subsequently published in “Optometry and Vision Science”, the journal of the American Academy of Optometry. Dr. Leung pursued a post-doctorate residency in binocular vision and pediatric optometry, at the Southern California College of Optometry, in Fullerton, CA. She taught in the pediatric and vision therapy departments at the Southern California College of Optometry for 4 years. Dr. Leung has obtained board certification in the treatment of ocular diseases. She also served as a senior and supervisory examiner for the National Board of Examiners in Optometry (the national board administers licensing examinations for over 40 states). Dr. Leung holds the highest level of licensing as allowed by the California State Board that includes the ability to treat glaucoma. Married to Dr. Leser, they are continuing the tradition of a family practice that was built by Dr. Melnik. 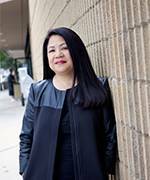 When she’s not seeing patients, Dr. Leung spends her free time travelling and serving the California State PTA at both the state and local levels.